Daniel Farke urged his Norwich side to stay focused after a "massive win" at Middlesbrough helped strengthen their position at the top of the Championship. Onel Hernandez's brilliant second-half strike was enough to earn the Canaries victory and left them five points clear of second-placed Leeds and seven ahead of Sheffield United in third, after the Blades lost at home to Bristol City. Boro wasted numerous opportunities to clear before Hernandez, having shaped to curl the ball across goal, whipped a superb shot in at the near post from the edge of the box. This was a seventh successive victory for Farke's side and, with seven matches remaining, they are in pole position to secure promotion back to the Premier League. Their next three matches - at home to Queens Park Rangers and Reading, and away at Wigan Athletic - all see Norwich come up against teams near the bottom of the table and a nine-point haul would leave them on the brink of going up. "I just can't praise the lads enough, "said Norwich head coach Farke. "Middlesbrough is one of the toughest places to come in this division, without any doubt, and they were switched on and focused so to be able to travel back with a clean sheet and the victory is outstanding and a big compliment to the lads. "The fans are allowed to celebrate. They are allowed to dream and be carried away. The most important thing is that we stay with our feet on the ground. "We want to go on winning games and after 39 games we are top, but we don't want to defend, we want to attack and finish top." 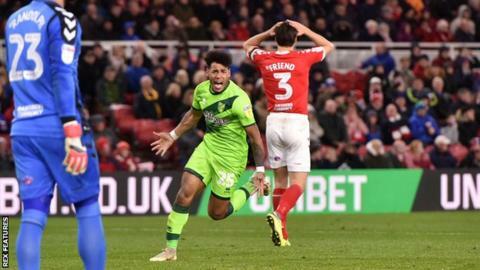 Middlesbrough had the better of the general play before the break and Daniel Ayala headed against the post at 0-0, but the Canaries' class told as the game wore on at the Riverside. Teemu Pukki twice missed chances when through on goal, while Boro goalkeeper Darren Randolph's stunning reaction save also ensured the Finland striker would not add to his 24 league goals this season. Hernandez had a decent opportunity to put the game beyond doubt with 15 minutes remaining, but could only send a tame effort straight into the arms of Randolph. He was nearly made to pay for his miss when Jordan Hugill found himself unmarked at the far post in the 90th minute, but the West Ham United loanee horribly mistimed his jump and the chance went begging. Middlesbrough's fourth defeat in a row leaves them outside of the play-off places for the first time since 9 August and facing a huge game against fellow top-six contenders Bristol City on Tuesday. It is the first time Boro have lost four second-tier games in a row since 2013 and they have won just once at home in the league this year. "We had very good opportunities to score. We need to finish the chances we are creating and we have been saying that since I came here. "Goals change games but when we get opportunities we don't put them away. We came back into it, we had three, great opportunities to score and, again, we have to score goals. "The big thing is we dropped our heads when they scored and we can't do that. It's an eight-game season and if we win on Tuesday we go back into the top six and players have to relish the challenge. "We have to really really hope and pray things start to drop for us. Let's bring it on and I hope the players feel the same as me. It is there for us and we have to make sure we graft." Match ends, Middlesbrough 0, Norwich City 1. Second Half ends, Middlesbrough 0, Norwich City 1. Attempt blocked. John Obi Mikel (Middlesbrough) right footed shot from the centre of the box is blocked. Hand ball by Mario Vrancic (Norwich City). Emiliano Buendía (Norwich City) wins a free kick in the defensive half. Substitution, Norwich City. Timm Klose replaces Onel Hernández. Attempt blocked. Emiliano Buendía (Norwich City) right footed shot from the left side of the box is blocked. Assisted by Onel Hernández with a cross. Corner, Middlesbrough. Conceded by Tom Trybull. Attempt blocked. Jordan Hugill (Middlesbrough) left footed shot from very close range is blocked. Assisted by Muhamed Besic. Substitution, Middlesbrough. Jordan Hugill replaces Ryan Shotton. Corner, Norwich City. Conceded by Aden Flint. Attempt blocked. Emiliano Buendía (Norwich City) left footed shot from the centre of the box is blocked. Assisted by Jamal Lewis. Tim Krul (Norwich City) wins a free kick in the defensive half. Corner, Middlesbrough. Conceded by Maximillian Aarons. Substitution, Norwich City. Mario Vrancic replaces Marco Stiepermann. Delay in match Marco Stiepermann (Norwich City) because of an injury. Attempt missed. Britt Assombalonga (Middlesbrough) right footed shot from outside the box is too high. Assisted by Stewart Downing. Attempt blocked. Stewart Downing (Middlesbrough) header from the centre of the box is blocked. Assisted by George Friend with a cross. Attempt missed. Emiliano Buendía (Norwich City) left footed shot from the centre of the box misses to the left. Onel Hernández (Norwich City) wins a free kick in the defensive half. Attempt saved. Onel Hernández (Norwich City) right footed shot from the left side of the box is saved in the centre of the goal. Assisted by Emiliano Buendía. Substitution, Middlesbrough. Muhamed Besic replaces Adam Clayton. Tom Trybull (Norwich City) wins a free kick in the defensive half. Attempt blocked. John Obi Mikel (Middlesbrough) right footed shot from outside the box is blocked. Assisted by Ashley Fletcher. Attempt blocked. Kenny McLean (Norwich City) left footed shot from the centre of the box is blocked. Assisted by Emiliano Buendía. Stewart Downing (Middlesbrough) is shown the yellow card for a bad foul. Maximillian Aarons (Norwich City) wins a free kick on the right wing. Attempt missed. Kenny McLean (Norwich City) header from the centre of the box is high and wide to the left. Assisted by Emiliano Buendía with a cross following a corner. Corner, Norwich City. Conceded by Stewart Downing. Attempt missed. Tom Trybull (Norwich City) right footed shot from outside the box misses to the right. Assisted by Marco Stiepermann.